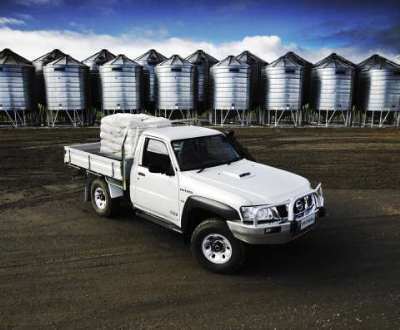 Nissan’s heavy duty ute – the Patrol Cab Chassis - will be launched in October 2007, with a new look exterior design and Nissan’s ZD30 3.0-litre inter-cooled turbo diesel engine. The ZD30 turbo diesel engine, which is also used in the Patrol wagon range, has recently been updated with a common-rail fuel injection system. The new common-rail fuel injection system provides improvements in engine refinement and responsiveness which is especially useful for highway driving and when working off road. With a maximum output of 118 kW at just 3,200 rpm and a torque delivery of 380 Nm at 2,000 rpm in five-speed manual transmission models, the ZD30 turbo diesel combines off-road toughness with good fuel economy. An additional benefit of the updated ZD30 turbo diesel engine is the increase to the rated towing capacity – 3,200 kilogrammes with trailer brakes. Exterior changes to the new Patrol Cab Chassis bring it into line with the Patrol wagon with a bold new face with Nissan’s trademark “four-wheel drive family” grille, new headlamps and revised front guards and bonnet. Patrol Cab Chassis models are available in two specification levels – entry level DX or the higher specification ST. In DX specification, buyers have a choice of either coil or leaf-sprung rear suspension. In 2006, Nissan added dual front airbags to the Patrol Cab Chassis for the first time and continues to lead this segment with this important safety feature on the new model. All DX leaf-sprung and ST coil-sprung models come with standard dual front airbags - 45-litre driver and 115-litre passenger airbag - while DX coil-sprung models are available with dual airbags as an option. The Cab Chassis’s reputation has made it a popular choice with rural and fleet customers looking for a reliable, spacious, comfortable and rugged workhorse. The 2006 upgrade to the vehicle’s safety specifications was as a direct response to feedback from Australian buyers – particularly fleet customers - as the local market accounts for 80 per cent of worldwide Patrol Cab Chassis sales. All models come fitted with Nissan’s five-speed manual transmission and a limited slip differential is also standard across the range. Comfort is an important customer issue and the Patrol Cab Chassis models offer impressive levels of interior quietness and ride comfort. Features such as double door seals (reduced wind noise and better dust sealing), wide opening doors, a CD player, air-conditioning and, on ST models, carpet, a large central console, power windows, central locking, variable intermittent wipers, side steps and map lights make long hours behind the wheel more enjoyable. Coil sprung DX and ST models are fitted with four-wheel disc brakes with dual piston front calipers, DX leaf-sprung models get 295 mm drum brakes on the rear. The coil-sprung rear suspension on the ST features five-link coils with trailing arms and an anti-roll bar. Both front and rear shock absorbers are double-acting telescopic and are located behind the coil springs for easy service and protection from stones, branches and other debris. At the front of all cab chassis Patrols is a long travel three link coil suspension with heavy-duty leading arms and an anti-roll bar. On the DX leaf-sprung model, the parallel leaf spring rear suspension provides optimum load carrying ability and durability in rough conditions. All DX models feature a driver’s bucket seat and a two seater passenger bench with hard-wearing cloth trim. The higher specification ST models have two buckets seats with high quality moquette interior trim for added comfort. Pricing for all variants remains unchanged, with the DX Leaf priced from $49,790* and DX Coil priced from $50,180*. The high-specification ST is priced from $52,890*. Nissan’s marketing product manager for SUVs and commercial vehicles, Gavin Corcoran, said the update Patrol Cab Chassis brings significant benefits for all users. “The introduction of the common-rail fuel injected ZD30 turbo diesel provides substantial performance gains over the previous model’s 4.2-litre diesel.